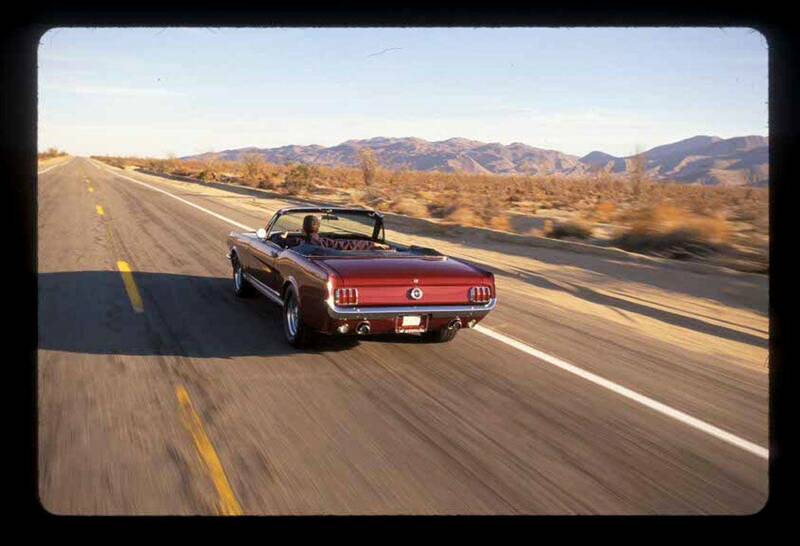 Yep, that's me driving my Mustang at speed through the California desert. 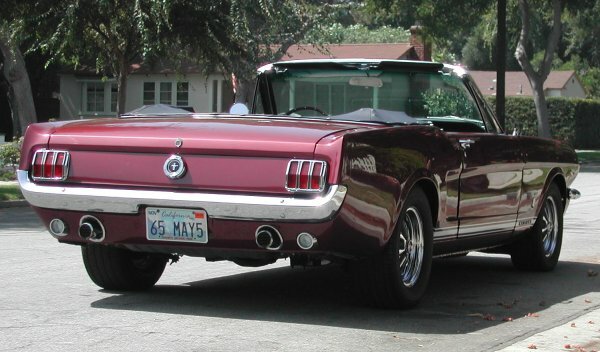 I really enjoyed this car: a very rare "K-code" model of the 1965 Mustang. This means it has the factory original Hi-Performance engine, suspension, interior and cosmetics package. The engine is the one that came with the car and puts out 271 hp from the 289 cu.in. V8. The paint is the original burgundy color applied after fully stripping the car down to bare steel and primed. It has a completely new and authentic black "pony" interior, wood grain dash and console, and the Rally-Pak (tach and clock). This car is quite possibly the finest example in existence. 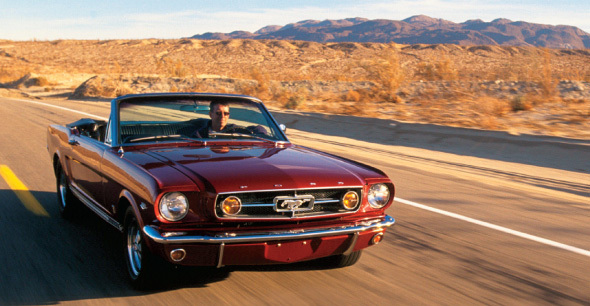 In 1998 the car was fully, and lovingly, restored to Absolute Original, by a Gold Judge of the Mustang Club of America. It was then updated with a Holley 4-barrel carb, front end suspension, rack and pinion steering and big disc brakes from a 1974 Mustang II, gas shocks, extra front end bracing, and lowered one inch all around. The wheels are the original styled steel wheels, but they have been widened considerably to accept the beefy radial tires. The tires were specially customized by hand to look like the original dual redline tires. The 5 speed manual transmission replaces the original 4 speed, and makes the car a real pleasure to drive at speed. Other features include state of the art security system, AM/FM cassette solid state radio with power antenna, 6-CD player (in the glove box), amber fog lites, seat belts, etc. The car was driven less than 1,000 miles since the total restoration in 1998. The odometer read 16,338 miles as of September 16, 2003. I finally sold it in the summer of 2004. 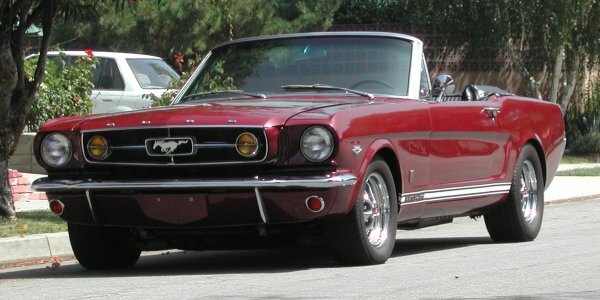 In 1965 I owned a new Mustang Convertible exactly like this (but of course it was completely stock). I purchased it for $4,500.oo brand new from McCafferty Ford (my father's store in Langhorne, PA). I drove it every day for two years, and on weekends I would race it in the Mason Dixon Sports Car Club and SCCA events in the area of Hagerstown Maryland, where we took home numerous trophies. This car was my basic transportation as I explored the Appalachian and Blue Ridge mountain areas of Maryland, Pennsylvania, West Virginia and Virginia while looking for prospects (I was a computer salesman for IBM). After 2 years of lots of miles and hard driving, I traded it in on a brand new Jaguar XKE convertible. It was a good time to be alive!